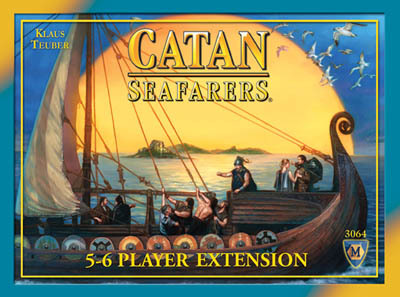 Extend your Catan Seafarersâ„¢ games to include more players and more scenarios. More components for two additional players. Allows for two additional players to be added to Catan Seafarersâ„¢. Another great way to get a few more friends involved. The expansions do extend the time of the game, but they also make it more accessible and must haves. If you've become tired of the same old settlers set up and game, be sure to give this expansion along with the Seafarers base a serious look. There is essentially no downside to picking this game up as I can't think of any negative effects that this would have on the game. Give it a try today! More sea tiles, more boats and more gold means more fun with this expansion to Catan! You will no doubt find it hard to play a 5 or 6 player game without this expansion! And for all the tiles and wooden pieces it is worth the price. Since we are often 5, and we love Seafarers, this was a no-brain purchase. The greatest thing about this expansion, however, is not the added players, but the fact that it comes with 10 new scenarios! This is enough to ensure that we will keep getting Settlers to the table for a really long time.